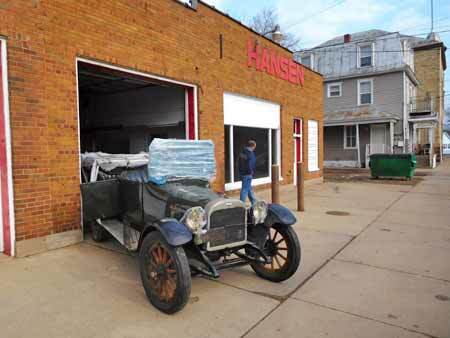 In Oct. 2015, we purchased an old building in Waupaca, Wis., that was erected in 1909 and has been an automotive building since at least 1917. In that year, a man purchased the building with the intent of partnering with a second man who held franchises to sell Oakland and Oldsmobile automobiles. All car enthusiasts are familiar with Oldsmobile, which was one of the pioneer makes. Oakland is less well known. The company grew out of the Oakland Buggy Co. and became part of General Motors in 1908. In the 1920s, Oakland was the first automaker to paint cars with nitrous cellulose lacquer. In 1926, Oakland introduced a companion car called to Pontiac. It sold so well that Oakland Motor Car Co. became the Pontiac Motor Div. of GM in 1932. We have been a member of the Pontiac Oakland Club International (www.poci.org) since 1972. Our collection contains four Pontiacs, but we never owned an Oakland. However, we helped start the club's All American Oakland Chapter and have always wanted to own one of those cars. Shortly after taking possession of the building, we drove to the SEMA Show in Las Vegas, making a few stops along the way that stretched the trip out to 4,200 miles. During the ride, our son Jesse was playing with his "intelligent" cell phone, so we asked him to look for Oaklands for sale. We had a vision of displaying an Oakland in the tiny showroom in the old building. 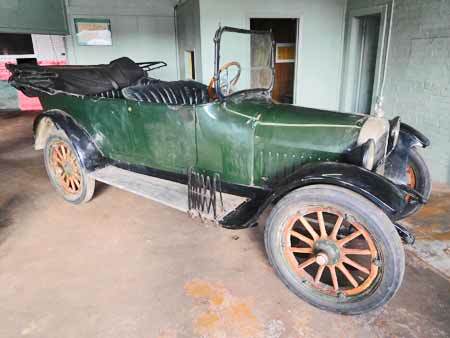 Little did we know then that we would find and purchase a 1917 Oakland Model 34 Touring Car to put in the showroom area. Jesse first ran across a man named Wayne Koffel who lives in Pennsylvania and had several Oaklands listed online for sale. It turned out that Wayne is a restorer who only restores Oaklands and rebuilds Oakland engines. He is a member of the Oakland Pontiac Worldwide Website and is well-known to Oakland collectors. The cars Wayne was trying to sell didn't belong to him. They had been listed for other Oakland owners who Wayne did work for. After chatting with Wayne on the Internet, we went away with a realistic view of the Oakland market. Wayne said that the early Brass Era Oakland and the 1930-1931 models with a V-8 engine were the most valuable. He said that the prices for these cars curve down and curve back up again. The Oaklands in the middle of the curve are harder to sell and generally worth less money. Shortly after encountering Wayne's offerings, Jesse discovered a 1917 Oakland listed on Craigslist in the Moline, Ill., area. The asking price was in our budget and we sent the seller an email. Long story short, we made arrangements to see the car, made an offer that was accepted and put a deposit on it. Then, we made plans to pick up the car in a week or two. According to Map Quest, the shortest mileage from the new shop to the car was 270 miles, but we planned a route that was a bit longer for two reasons. We would be towing the car home on a 20-ft. long open trailer so we wanted to avoid Interstate highways where the speed limit was 70 mph. We also had to pickup another son, Tommy, to help us load the car on the trailer. 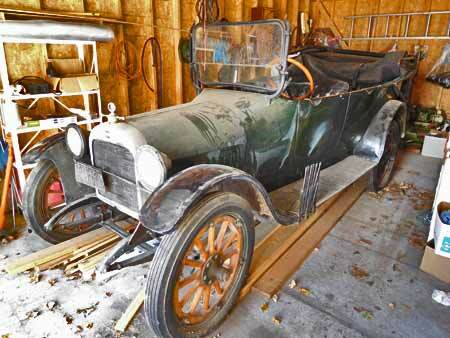 The car was in pretty nice "garage find" shape-but not a "barn find" jalopy by any means. The man selling the car had bought it in the 1990s and used it in a few parades, before parking it for years. The battery was old and dead and we assumed the car was not going to run—at least not without some work at a later date. That meant we had to have a way to winch the car up onto the trailer. 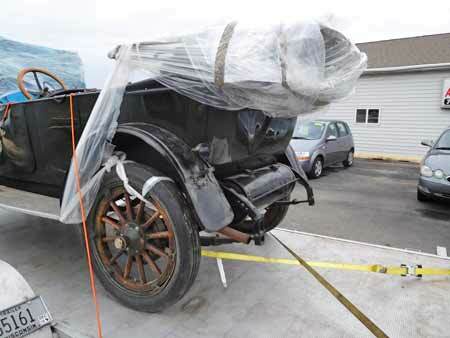 The 1917 Oakland Model 34 65-passenger touring was a garage find, but we figured we were not going to be driving it onto our trailer anytime soon. We have towed home a number of cars including a couple of MG TDs, a Triumph or two, a 1948 Chrysler coupe body on a dolly and a non-running 1949 Studebaker. In most cases we drove the car on the trailer. The sports cars fit in our 14-ft. enclosed trailer, which had its own challenges. The Oakland was not going to enjoy some of the advantages of an enclosed trailer. The Chrysler body was a closed car and it was light enough to push it on the open trailer with four or five helpers. We used a trick for the Studebaker Commander Starlight coupe. A friend had stored the car until we picked it up and he also had a big pickup. We "jackknifed" my truck and trailer at almost a right angle and the friend hooked a long chain to the car, ran it along the middle of my trailer to his truck and pulled the Studebaker up onto the trailer with his truck. We had only one truck and trailer planned for our trip to get the Oakland. The truck is a 2013 Ford F150 Crew Cab and the trailer is an aluminum one with a manually tilting deck. We had to have a way to get the Oakland out of the garage and up on the trailer deck and then pull it far enough forward to make the deck go down under the weight of the car. We decided to buy a winch. Being on a tight budget around Christmastime, we purchased our winch at Wal Mart. It was marketed by Reese, a name that we respect, but the winch itself was made in China. It was only a 2,000-lb. winch, but at $69.95, it was right in our price range. We had the winch mounted on the edge of the deck where it rises up when you lower the hydraulics. Our body shop friend who attached it said, "That's a pretty light-duty unit, but I think it will do what you want it to." He did like the fact that it was small in size, so most cars can roll right over it. 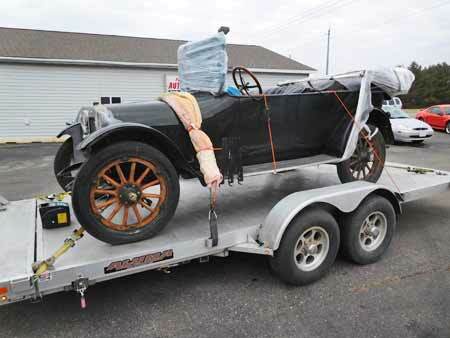 With the winch mounted on the trailer, we began to think about some of the challenges involved in towing a big open car that was nearly 100 years old some 350 miles to the new shop. We knew right away that it would be a more difficult job than any of the towing we had done before. We figured the best thing to do was gather some tips from experts like Donald Barlup, Byron "Joe" Stout and Don Chandler. Barlup and Stout are long-time Oakland owners who have towed old cars across country many times. Don Chandler was the president of the Capital Model T Club near Madison, Wis., for many years. Here are a few of the tips they gave us for towing home our Oakland. Here's the car with everything secured for the trip home. The 20-ft. Aluma) trailer has the winch mounted near the front edge of the tilting deck. The car has to be far enough forward to bring the deck down. Those large, glass headlight lenses were often held on old touring cars with screw-on metal rims. If they are in any way loose, wind can get up behind them to force the rims loose and send the glass lens flying in the wind. Motometers are "radiator caps" with a temperature gauge built into them. If the threads are damaged, they may fit loosely and fly off in the wind. Even if they fit tight, they are easy for someone to steal when you make a stop to eat or sleep. The motometer is removed from the radiator, a padded strap secures the hood and the headlight rims and lenses are wrapped in cling held in place with duck tape. If the car has an air cleaner (the Oakland didn't) you should remove it before air or wind does it for you. A blast of wind can get up under an old air cleaner and send it flying into the hood, before it drops through the engine compartment and blows away. The spring loaded latches that fasten old hoods to these cars can also be sent flying by a strong blast or air or wind. Sometimes it's easy to completely remove the hood. If not, strap it down with a padded tie-down strap. The upright windshields on these old touring cars are not very aerodynamic. 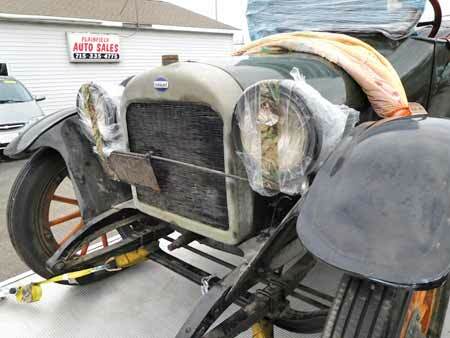 If they fold, such as a Model T windshield, tow the car with the windshield folded forward. It cuts down wind resistance. The Oakland windshield did not fold and had two panes of floppy glass. We padded them with a quilted moving van blanket and wrapped the blanket and windshield with a wide piece of plastic cling. We made sure to wrap the cling around the windshield about seven times. The split windshield did not fold in the middle like a Model T Ford windshield. We wrapped it with a blue, quilted moving man's blanket and then wrapped multiple layers of cling around everything. 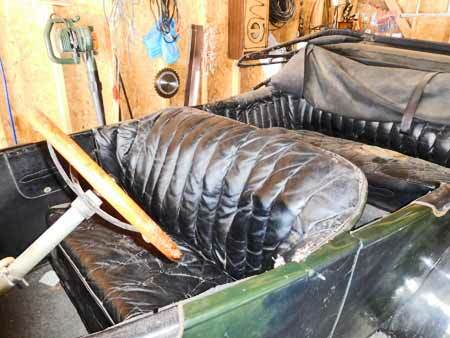 The front and rear seat cushions on these old touring cars can usually be removed just by yanking them up. If you don't yank them out of the car yourself, the wind might do it for you! The front and rear seat cushions pull right out of the car was were removed for towing. Otherwise the wind can pull them right out of the car as it is traveling down the highway. That's not good. Make sure that all of the doors are latched and then secure them in some manner. This is especially important if the car has any front-opening "suicide" doors. If caught by a strong gust of wind, these kind of doors can be pulled right off a car. Door should be secured, especially those "suicide" doors up front. 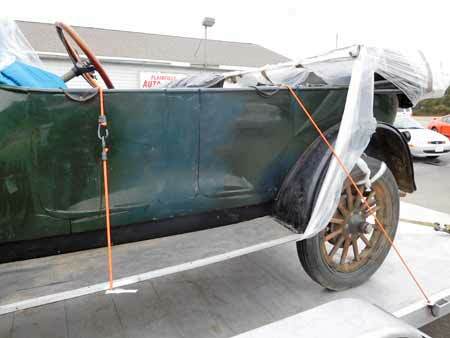 The door latches on the Oakland were very tight, but we still used heavy bungee cords for an extra measure of safety. We considered covering the whole car with the type of plastic that mariners cover boats with. This is usually white, but we bought a 20-ft. piece from a boat shop for $20 and it was blue. 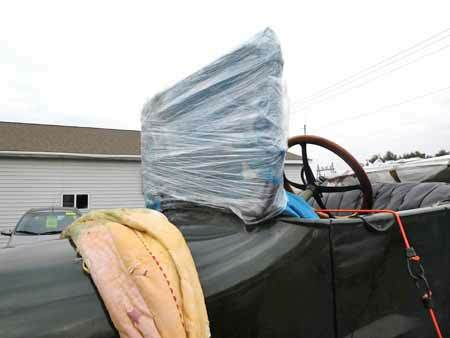 We thought we could shrink wrap the car with this stuff by heating it with a heat gun, but the mariner said that they actually use a special propane torch. Since we didn't want to burn the car up, we avoided using the stuff, but we do plan to do more research on using this "shrinkable" plastic. For this trip, we wrapped the touring top with our heavy-duty cling and then used duck tape over the cling. It worked pretty well. Folding top was wrapped in cling, but after awhile the wind got under it and made it start to unravel, so we criss-crossed duck tape over it. Also check out the criss-crossed tie-down straps, which is a good idea. We prefer cinching our loads down with tie-down straps. We were warned not to make the straps extremely tight, as some smaller cars of this type could actually be damaged by over tightening straps. The ratchets should be cranked up pretty firm, but you just don't really need to give them that little extra crank most towers use. One thing we definitely should have done was to pad another strap or two with blanket material. They lessen the worry about rubbing paint off . Our 2,000 lb. winch did a pretty good job of pulling the Oakland onto the trailer. But it was the first time we used a winch and when setting it up, we didn't guide the cable onto the spool as neatly as we should have. The winch stopped pulling the car a little earlier than we wanted it to stop. It took a bit of pushing to get it far enough forward that the trailer deck dropped. If we had guided the cable on better, the winch would have pulled the car all the way up. This 200-lb. 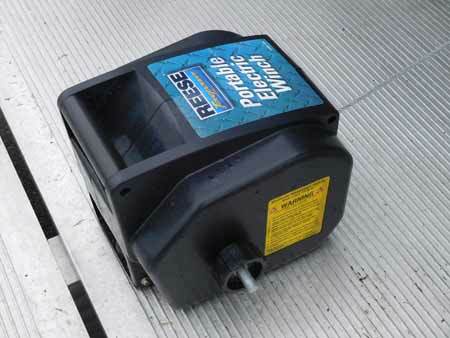 Reese Towpower Portable Electric Winch was enough to get the Oakland on the trailers. We powered it was a 12-volt car battery. One nice thing about this winch was its compact size. We towed the car about 250 miles the first day, than got a motel. We did not want to tow a car after dark. In the morning we did what we thought was a complete check of everything, but we put our soft luggage down on the front hitch section of the trailer. We drove about 80 miles with the luggage sitting there. It wasn't tied down and we had two cameras and a iPad in the bag. When we stopped to take a picture of a Nova gasser for sale at a used car lot, Jesse went to get the camera. That's when we realized the luggage had been left on the trailer. We were lucky and you can bet this won't happen again!. The Oakland arrived safely at its new home. The car's tires were low on air and we left it like that during the tow so it wouldn't try to roll a lot on the trailer. We filled the tires before giving it a final manual push into the building. The car has many years of dust on it, but it still looked pretty good in the old showroom after all of the towing aids and protective padding was removed. Future plans call for cleaning it and decorating the old Oakland dealership.